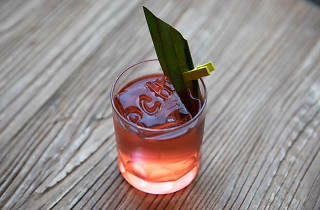 Photograph: Virginia Miller Leeward Negroni at P.C.H. A welcoming, brick-walled bar with boundary pushing craft cocktails. The folks behind Press Club and Schroeder’s meant the Pacific Cocktail Haven to be a friendly little neighborhood bar but, thanks to its stellar bar program, it’s become something more like a destination for the sophisticated drinker. Even so, this intimate brick-walled Union Square space maintains its casual, welcoming vibe with artisanal cocktails that span the shelf from Japanese whisky to low ABV creations and tiki-style punches. For a Eastern-inspired marvel, check out the tongue-tingling Underwater Cinema, made with Monkey Shoulder scotch, ghee, nori, vermouth, wasabi and bitters.